— Review from BFS for Elizabeth’s recording of Telemann’s Fantasias. Elizabeth studied at the Royal College of Music as a Junior Exhibitioner (where she was awarded the Sally Wainwright woodwind prize in 1985) and as a graduate at the Guildhall School of Music and Drama, studying renaissance flute with Nancy Hadden, baroque and eight – keyed classical flute with Stephen Preston and modern flute with Kathryn Lukas. She went on to do a postgraduate study of Early Music at the Koninklijk Conservatorium in The Hague, studying with Wilbert Hazelzet and receiving masterclasses from Barthold Kuijken. During this time as a student, she was involved in a number of recordings for the New London Consort under the Decca label (recorded using my maiden name – Elizabeth Stanbridge) including; Susato Danserye 1551, The Sylvan and Oceanic Delights of Posilipo, Monteverdi Vespers 1610, Locke Psyche, Blow Venus and Adonis and Telemann Water Music. 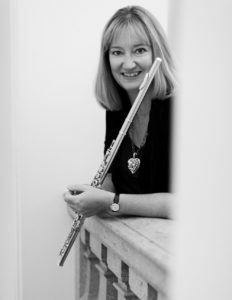 Elizabeth has arranged and recorded music for flute and piano, including her highly successful ‘Four Strauss songs’ published at Alry Publications; and has written two award winning study books, ‘Baroque Flute Studies’ (Winner – Best Flute Method NFA 2015) and ‘Baroque Studies for Modern Flute’ (Winner – Best Flute Method NFA 2017) available from wonderfulwinds.com. Elizabeth has recorded the Telemann 12 Fantasias and Flute Sonatas by J.S. Bach on a FluteMakers Guild flute and Schubert’s works for flute and piano for the record label ‘Devine Music’ using her original Louis Lot flute, no 435, coupled with Chopin’s Pleyel piano dating from 1848.